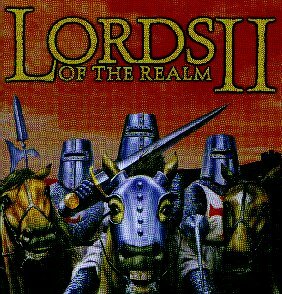 Lords of the Realm is a war game set in the middle ages. The game has two parts: marching around on the map and the battles. Marching around is turn-based, but the battles are in real-time. The troops range from worthless peasants to armored knights. The stragedy of a battle is fairly simple: line up your swordmen and pikemen in front of your archers and try to get your fast knights and macemen into their archers. The terrain of the battles varies from rivers and bridges to wide open fields to densly wooded forests. There are also castle seiges and you get catapults and battering rams for those skirmishes. The stragedy of marching on the map is even easier, counquer the counties closest to you until you have them all. The hardest part of the game is resource management. You only have so many people to farm, cut wood, mine stone and iron and build your weapons and castles. And they all have to eat. Your land can be used for raising cattle or growing wheat. Wheat can be stored; meat and dairy products cannot. If your subjects get unhappy, they may riot. You can buy them ale from the merchant which temporarily lifts their spirits. Here are some of the scores of my battles.